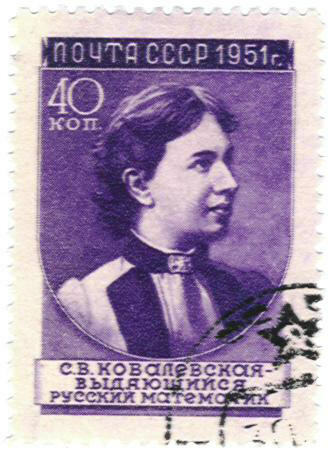 Sonja Kovalevsky was born Sophia Korvin-Krukovsky in Moscow and received her early education with hired teachers in the home of her parents. Supposedly, one of the rooms of her home was papered with the pages from a calculus book, and she initially learned calculus from the walls of this room. Since Russian universities were closed to women, she decided to study in Germany; she entered into a `fictitious marriage' with Vladimir Kovalevsky to enable her to travel to and study in Germany on her own. She first went to Heidelberg, but after three semesters went to Berlin to study with Weierstrass; despite the efforts of Weierstrass, DuBois-Reymond, and Helmholtz, she was barred from the university due to her gender. Impressed with her talent, Weierstrass taught her as a private student; they were to be friends and correspondents for the rest of her life. With the support of Weierstrass and others she was awarded her degree in absentia from the University of G\"ottingen in 1874; she was the first woman to be granted a doctorate in mathematics and one of the first in any field. Eventually, through the urging of Mittag-Leffler, she was appointed Professor of Mathematics at the University of Stockholm becoming the first women to hold a chair at a European university since the mid-eighteenth century. She belonged to a circle of mathematicians, sometimes known as a `mutual admiration society', that included Hermite, Mittag-Leffler, Picard, and Weierstrass. Kovalesky, in addition to being a mathematician, was a novelist and a celebrity well-known for her avant-garde views; among her friends were George Eliot, Henrik Ibsen, Fedor Dostoevsky, Anton Chekhov, Charles Darwin, and Aldous Huxley. Mathematically she contributed to the areas of partial differential equations, Abelian integrals and functions, and theoretical mechanics. She was awarded the Prix Bordin of the French Academy of Sciences for her memoir On the rotation of a solid body about a fixed point.